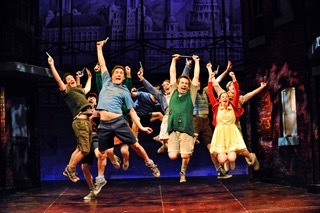 When the Daily Mail’s Patrick O’Neill reviewed the original production of Blood Brothers on 10th January 1983 he said: “It may be a little early in the year for prophecy, but I rashly predict that come December this extraordinary show will be among the best new musicals of 1983.” The legacy of this stunning musical is as strong as ever, with it now being prominently featured in English and Drama curriculums at schools Nationwide. Hundreds of school children flooded into the New Victoria Theatre last night and filled every seat in the auditorium. 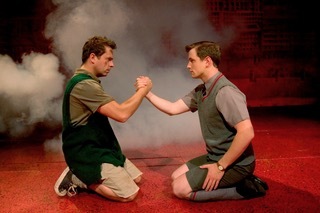 Branded “A Greek tragedy with a Scouse Accent” (O’Neill, 1983) Blood Brothers is the heart-wrenching and captivating story by Willy Russell, of two twins who are separated at birth and grow up not knowing the other exists. One brother leads a life of privilege and high-class education, while the other belongs to a family who can barely make ends meet. When they are finally re-united, the outcome is destructive and unalterable. Leading this cast is Sean Jones as Mickey, and Mark Hutchinson as Eddie. For these two actors, and for Jones in particular, there is an almighty spectrum to be covered in this intense drama. 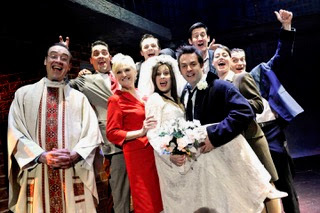 Blood Brothers takes us on a journey across approximately 30 years, and for Mickey, Eddie, Sammy (Mickey’s older brother, played by Adam Search) and Linda (Alison Crawford) this journey starts in childhood from aged 7, through their teenage years and into marriage and adulthood. Jones’s characterisation of Mickey was perfection, and no less. From the development of his voice and thickness of his accent, his flailing arms and pretend horse-riding as a child, through to his angst-filled teenage years and deeply depressed adult years, he took us on a gripping journey and kept the audience hooked throughout the evening. Hutchinson’s ‘Eddie’ was significantly less likable (perhaps the rabbles of school children simply warmed to Mickey’s comedic personality more? ), but he earned his applause from the audience, particularly in Act II. The role of Mrs Johnstone is one of the most highly regarded female roles in musical theatre, so to find the “definitive” choice, publically voted Lyn Paul was playing the role had me very excited. She made her debut as Mrs Johnstone in 1997 and has regularly reprised the role over the last 20 years. Unfortunately, her alto range struggled with some songs through the evening and her acting left much to be desired, until the final and most famous number of the evening “Tell Me It’s Not True” when she finally opened her heart to us and left barely a dry eye in the audience. Dean Chisnall’s ‘Narrator’ was disturbing and chilling – in the best sense. The Narrator is suggested to be the physical incarnation of The Devil. To embody such a role with the level of quiet energy that Chisnall does is no easy feat. His stance was so intimidating; it sent shivers down my spine. A magnificent performance. The ensemble cast roles are wonderfully written by Russell and offered some audience favourite moments of the night. The show does not stop to allow applause after songs, but on more than one occasion in Act II, the hilarity of the action on stage caused a break-out of laughter and round of applause to temporarily pause the production while the audience re-settled! Graham Martin’s Principal/Teacher on-stage costume change won the biggest laugh of the night, and deservedly so! It was a perfectly executed moment of comedy. Adam Search’s “Sammy” also shines in his very first appearance when he has a ten-year-old’s tantrum. This show is still a superb narrative on the class divides within the UK and has many other themes which are still very relevant but with this tour, the music sounds very dated, some of the lines were poorly spoken (the exchange about ‘new shoes on the table’ was just dreadful) and the lighting is really quite poor. However, as the curtains fall and you’re left wiping tears away, all the negatives melt away. Despite its flaws, this show is one written about love in all its forms, and it leaves you aching in the pit of your heart. 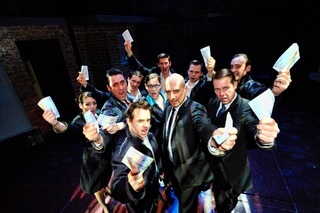 Blood Brothers is as poignant and authentic as it was when it first opened 34 years ago. I defy you not to stand and applaud its magnificence.